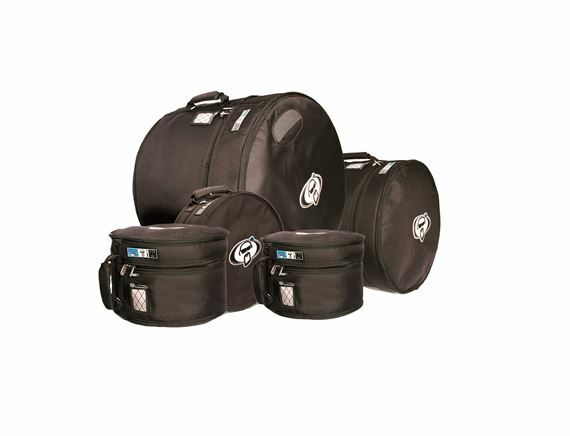 Shop Protection Racket Padded Drum Bag Set1 10/12/16/2218/14X65 from AMS with 0% Interest Payment Plans and Free Shipping. Providing ultimate protection for your drums, the Protection Racket drum bag set is in use by some of the top drummers of today. All drum cases have been designed with the gigging drummer in mind. Protection Racket uses incredibly durable construction of lightweight protective material. Easy storage at gigs, and super quick pack up time at the end of the night. Protection Racket is proud to offer Pre-Pack configurations which include the most popular sizes and configurations in the line. Contains 10" x 8" Tom with RIMS, 12" x 9" Tom with RIMS, 16" x 16" Floor Tom, 22" X 18" Bass Drum and 14" x 6.5" Snare Drum. In the unlikely event of a fault with one of Protection Racket cases, at their discretion, they will repair it or replace it free of charge. All Protection Racket cases have an integrated three layer construction of Racketex, Propadd and Propile which are doubly stitched. First the main body of the case is stitched using bonded nylon that doesn't deteriorate and holds the case together even if an area of stitching is breached, next the sides or end circles. These two parts are then stitched together using the same bonded nylon to form the case. This method of construction ensures twice the security at all case corners and edges for greater protection and durability. Both handles and seams are doubly secure by the former being stitched to the seams 1,500 kilo breaking strength webbing, rather than to the body of the case. Protection Racket cases have no inherent weakening or lessening protection at the corners and edges that take the majority of the knocks. The cases are semi-rigid not floppy. The sides of the cases remain upright during insertion & taking out of instrument, and their one-piece construction ensures effortless functionality. All the RIMS cases are 1 inch larger on their internal diameter to take into account your suspension mounting system. The internal depth of the case is the same. I really love these cases and how very protective they are for my gear. I would suggest anyone to these cases because they are very productive, worth the money, and beyond useful. Thank you very much for these cases. These cases are a must have to any drummer in need of protection of their kit. I won’t lie, I used to think Protection Racket Cases were outside of my reach; not anymore. The fleece lining alone makes it worth the purchase.